The 800 year old place Kottenborn located 4 Km from Adenau at an altitude of 500 meters, embedded into the fascinating Hocheifel landscape. Enjoy nature, whether on foot over rough and smooth, or by bicycle. Countless hiking and biking trails and designated mountain bike trails run through the valleys, highs and mountains with magnificent views. Don't neglect to visit the chapel build in 1403. The late Gothic choir was built in 1525, cultivated the biaxial ship in the 17th century. An exchange and the renovation of the roof was carried out in 1826. In the from country, country district, bishopric and community financed, extensive restoration were uncovered valuable cultural history, late Gothic frescoes. A second bell was installed in 1984. A new renovation was carried out between autumn 1999 and autumn 2000, with renewed among others, the exterior plaster and the rotten tip of the bell tower was rebuilt. Other attractions in the area invite you to an unforgettable visit: Kottenborner Mühle (Mill) , Eifel farm museum, local history museum and guild museum, historic center and historic district butter market in Adenau, the Nürburg, the Kaiser Wilhelm Tower on the Hohe Acht, etc. 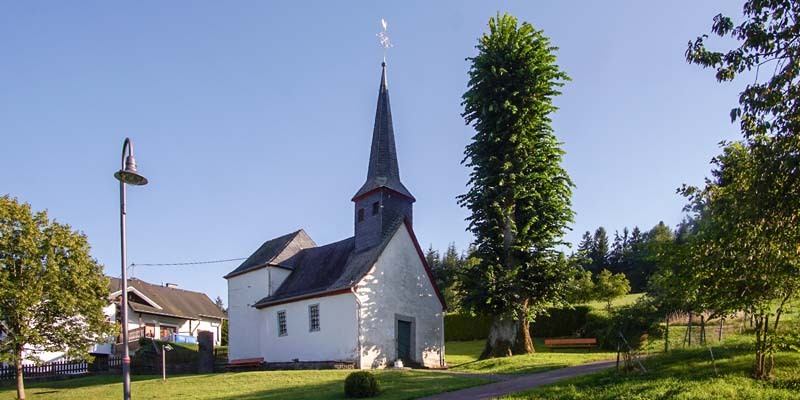 Kottenborn is located in the territory of the transport association Rhein-Mosel. Bus number 861 of the Rhein-Mosel public transport company connects the village on weekdays with the city Adenau. The nearest railway station is in Ahrbrück at the Ahrtalbahn (Ahr valley railway) to Remagen.